Brock’s new arts faculty blends an old factory, left, with an annex that includes classrooms and a studio theatre on stilts. The view from Highway 406 of downtown St. Catharines has for decades been the ramshackle back of old buildings. Their fronts sit on a shelf of earth along St. Paul Street. Their backs stretch down to the valley of an old section of the Welland Canal. It had become a disused space, exposed to passing drivers, part of the city’s rust-belt roots left derelict (and even a little dangerous, say a few St. Cathariners). Some of the old brick buildings rest on stilts anchored down onto the lower valley floor. But as residents drove past year after year, accepting and finding beauty in the familiar, a former dean of humanities at Brock University, Rosemary Hale, also saw opportunity. Eight years ago, she convinced artist and philanthropist Marilyn Walker that the university (which can be seen on the horizon, a considerable distance away) needed to bring its art faculty to the site. And the school has now arrived. The city sees it as central to the revitalization of the downtown and calling card for new development and investment. “You won’t recognize St. Catharines 10 years from now. I guarantee it,” Mayor Walter Sendzik said. The old, brick Canada Hair Cloth Co. factory on the valley floor, a factory that used to make parachute silks and linings for men’s suits, has been renovated into Brock University’s new, $46-million Marilyn I. Walker School of Fine and Performing Arts. Inside, the white-washed interior with an array of airy art studios, music practice spaces, digital media labs and faculty offices blends the typically tightly packed academic spaces required with the old wooden floorboards, overhead beams and other details of the original factory. Behind the building, a few paces away, lies the First Ontario Performing Arts Centre, a brand new four-theatre venue. Both buildings were designed by Toronto-based Diamond Schmitt Architects, won with separate rounds of tenders with Brock University and the city. Then at the other end of the patch of land behind the downtown, what was once a raceway of water from the canal and used for powering the cloth looms, now sits the 5,000-seat Meridian Centre, only a year old and used for larger concerts and Niagara IceDogs’ junior hockey games. The aim is to invigorate the downtown through arts, education and entertainment. Already developers are planning new apartment buildings and downtown high rises, the mayor said. Since St. Catharines is surrounded by the Green Belt of protected natural land, the only direction for building significantly more homes is upward, he said. “This will be a catalyst which will draw not just people, but investors as well. We’re already seeing in our office a heightened interest in the downtown, buying properties with the intention of building up. ...We’ve been seeing it for the better part of a year now,” Mr. Sendzik said. 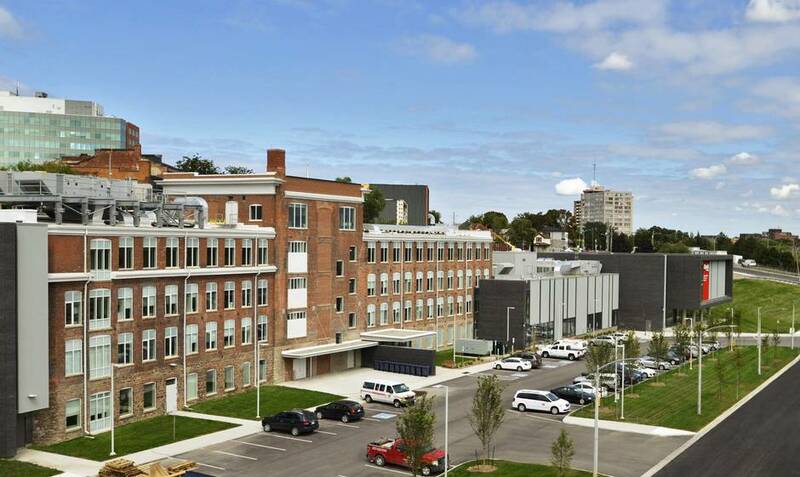 Among political leaders and planners, “there is a new feeling of optimism in downtown St. Catharines,” said regional MPP Jim Bradley at the recent opening the new school, adding that this was something the community needed. It was easy to get the impression at the art school’s opening ceremony that the city is riding a wave of good luck. Brock University’s decision to immerse its art students and facilities in the downtown (including such details as not including food services in the school, so that students and faculty will need to venture into the downtown that much more every day) is a stroke of good fortune for the city. But that belies Brock saying it is just as dependent on the city, as the city depends on Brock. True, the new performing arts space wouldn’t have been as big without the new neighbouring art school. “Without the relationship with the university, we would only have built two [theatres], like normally an arts centre would. But because of that relationship and the need of the university, we were able to bring two more performing stages to the arts community,” said Steve Solski, executive director of the FirstOntario Performing Arts Centre. Brock president Jack Lightstone indicated that the planning was very much a two-way relationship. Brock needed the city on board, or the art school’s move wouldn’t have worked. “If someone is not willing to really join you as a partner – and that means not just joining with words, but with deeds – then how do you know you matter? If someone is not willing to say, ‘We’ll throw in our lot with you. You do this, we’ll do that,’ it’s the only measure that you really matter,” he said. During the initial stages of Brock’s planning, Dr. Lightstone noted that the redevelopment of the downtown was also an issue in a municipal election, with a call for a new economic development plan for the city centre. And it was a cause championed by the area’s chamber of commerce, led at that time by Mr. Sendzik, who was later elected mayor in 2014. “The university said that, ‘If you’re going to do that, we insist on being at the table’ – in other words, not just to carry out the plan, but to be a partner in drafting out the plan, which we did,” Dr. Lightstone said.